This page describes HDMI cables. See the data cable page for descriptions and pinouts for PATA/IDE, SATA, USB, and even floppy cables. HDMI or High-Definition Multimedia Interface is a compact interface for moving digital data at 10.2 Gbps using TMDS or Transition-minimized differential signaling. 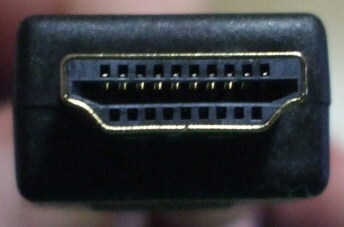 HDMI 1.0 used a 165 MHz clock and supported 1080p (1920x1200) resolution at 60 frames per second. HDMI 1.3 uses a 340 MHz clock and can support higher resolution like WQXGA (2560x1600) across a single digital link. The cable carries three TMDS data channels: Data0, Data1, and Data2, plus a TMDS clock channel. The differential signaling means three wires for each: DataN+, DataN-, and DataN shield. Each channel has 3.40 Gbps throughput using 8b/10b encoding. Each 10-bit TMDS symbol represents an 8-bit data value. The 8b/10b encoding is a two-stage process designed to minimize 0/1 transistions and balance the overall DC level. The first stage leaves the first bit untransformed. The following 7 bits are then either XOR or XNOR transformed with the preceding bit. The XOR/XNOR decision for the word minimizes the 0/1 transitions. An added ninth bit encodes whether XOR or XNOR was used. The second stage may invert the first eight bits if that evens the balance of 1s and 0s and therefore would balance the average DC signal level. An added tenth bit encodes whether or not the second stage inversion was done. The plug connector seen here is the common Type A. It supports all HDTV modes. 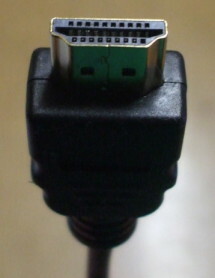 The Type B connector is about 1.5 times as wide and can carry twice the data of Type A. Most manufacturers are simply using dual Type A links. Types C, D and E are Mini, Micro, and Automotive variants, respectively. As for the cables, Category 1 or "Standard" HDMI cables have been tested at 74.5 MHz and would support resolution up to 1080i at 60 frames per second. Category 2 or "High Speed" cables have been tested at 340 MHz and would support resolution up to 1080p at 60 frames per second and 2160p at 30 frames per second. Three HDMI Type A receptacles and one SVGA receptacle on a high-definition television.